Appendages bearing arrays of hair-like structures serve important biological functions in many animals from a variety of phyla. For example, feathery gills take up oxygen, hairy olfactory antennae capture odorant molecules, filamentous suspension-feeding structures catch single-celled algae, setulose appendages create ventilatory or feeding currents, and bristly legs or wings propel little animals through the surrounding water or air. To perform any of these functions, an array of hairs must interact with the fluid around it. Therefore, in order to elucidate basic rules governing how hairy appendages work, we have been studying the fluid dynamics of arrays of cylinders. 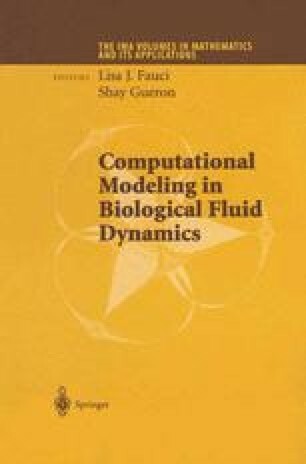 The purpose of this paper is to provide a brief overview of what mathematical and physical models have taught us about fluid motion around and through arrays of hairs, and of how those insights have helped us unravel ways in which the function of hairy appendages depends on their structure and behavior. I will focus on examples of appendages that capture molecules: the olfactory antennae of various arthropods.